Carole's reading the Harry Potter series to David. He had not read the books so they are reading the books and then watching corresponding movies. She's missing book 5 and 6 in Connecticut. She is certain they were left at home. I found book 6, the Half-Blood Prince, Tuesday night. I have not been able to find the 5th book, The Order of the Phoenix. As I was searching, I came across our stash of Dr. Suess books. I pulled a couple out and quickly paged through them. Are there any books more guaranteed to put a smile on your face than Dr. Suess books? We all know his story, how his editor challenged him to write a book using only 150 words. Out came The Cat in the Hat. He probably "invented" children's literature as a genre. 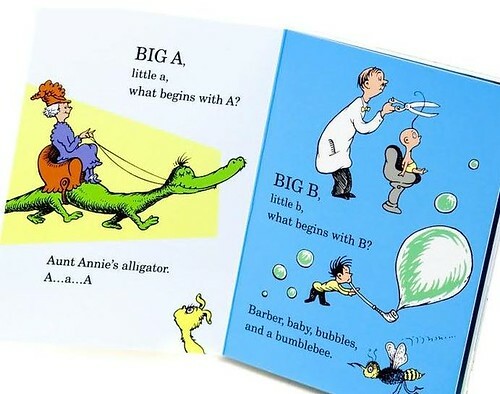 I think he also, with later books, such as his alphabet book from which the title of this post derives, showed that nonsense words could be playful and legitimate in a story. I've got so many books. Being surrounded by books is a necessary in my life. I couldn't find the alphabet book as I was looking through the stack. I wonder if it was destroyed in one of the many water-in-the-basement episodes we've had over the years. When I was designing dungeons at the time I played Dungeons and Dragons, I relied on situations I'd read about including a problem lifted from directly from Bartholomew and the Oobleck. Someday, I would love to have a room that is a library, floor to ceiling bookcases with every book I own carefully organized and handy. The search for these two books as well as her collected Chronicles of Narnia, has caused me to (gasp) do a little cleaning in small sections of the basement. I am going to, and I know you will faint, get rid of the apple computer boxes I still have in the basement. I don't need them and they can be broken down and recycled. I'm going through those two boxes "over there" and either tag stuff to give away, toss stuff or put it where it can be used. I resolved to be better about the mess. Baby steps. Baby steps. Clean a section here. Clean a section there. Do I really want to save 'this' when 'this' hasn't been used in 25 years? Dr. Suess books are exempt from this question. Wish I had a nickel for every time one of our sons quotes something from a Dr Seuss book they remember. My dad had a LOT of those kind of things and when I say them, one of the boys says, "I bet that's a grandpa-ism"
And of all the entertainers in the world, Bill Cosby has MOST influenced our family when it comes to repeated phrases. ALL of us have a huge repertoire of his statements from his many routines. Have you ever heard his "chocolate cake" routine about giving his kids chocolate cake for breakfast? And then giving them grapefruit juice with it when they wanted something to drink? The audience GROANS when he says that and his response is "this is NOT your child" to the audience. I can't tell you how often I have quoted "this is NOT your child" about any number of instances! And interestingly, many of those phrases, when said out loud, "transport" me back to another time and place for just an instant. Smells do that too...aren't humans funny and interesting!